The world of New Thought widely recognizes and appreciates the value of visioning as well as visualization. For example, the January 2009 issue of Science of Mind Magazine has several related articles. One of them is copied below after the introduction to the 10 Step Co-creative Visioning and Strategic Planning Process. 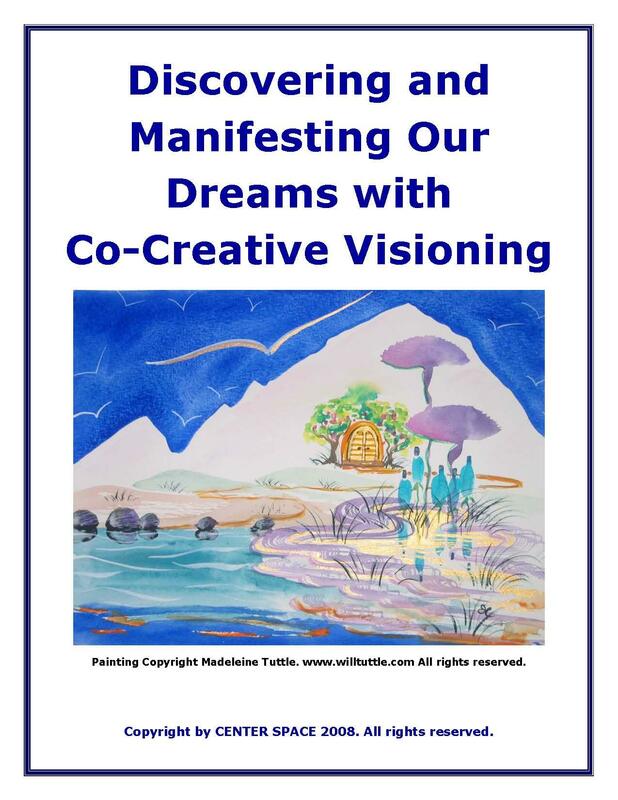 In addition, Ultimate Destiny University has developed a 10 Step Co-creative Visioning and Strategic Planning Process. The creators have been paid as much as $25,000 to facilitate the process for non-profit organizations, companies, chambers of commerce and communities. The complete 10 Step Co-creative Visioning and Strategic Planning Process will be made available at no cost to participants in the New Thought Demonstration Project. You can “catch” the highest idea for your life when you attune to’ the guidance of your deep nature, the voice of Spirit within you. Dr. Michael Beckwith, origina­tor of the transformational technique he calls life visioning, has developed a step-by-step process to reveal your greater-yet-to­-be. I’m ready, willing, and able to accept more good than I have ever experienced, imagined, manifested, or expressed before. Is this the statement you are saying to yourself as you enter into the New Year? If so, you are using the powerful affirmation suggested by Dr. Michael Bernard Beckwith to open to your greater yet-to-be, and you are laying a foundation for amazing events to come forth in your life, as your life. This affirmation is a beginning step in the adventure of “life vision­ing,” a spiritual technique practiced and taught by Beckwith now for more than two decades with remarkable results, including the global expansion of Agape International Spiritual Center as well as numerous other min­istries and spiritual activities around the world. Beckwith’s life visioning process involves recognition of one’s true nature as a spiritual being on a continual journey of greater unfolding, uniquely and more fully revealing and expressing the qualities of Spirit. Visioning, says Beckwith in his six-CD course Life Visioning, produced by Sounds True, offers an opportunity to participate consciously in the evolution of life. We can “catch the eternal broadcast from the Mind of Life Intelligence and translate this into reality,” he says. Unlike New Year’s resolutions, which often focus atten­tion on an appearance of lack or imperfection, Beckwith’s process opens us to an awareness of Spirit as our life. Visioning attunes us to the unlimited pos­sibilities and greater ideal. We are heeding the call of Spirit within. In doing so, we are not asking Spirit to do something for us; our method is never to tell Spirit, “I want this; make it hap­pen.” Rather, when we vision, we allow Spirit to be expressed as and through us. Through visioning, we train ourselves to be able to hear, feel, see, and catch Spirit’s highest ideal for our lives. “We’re not here to tell God what to do or to ask God for things, but to absolutely be avail­able for what God is already doing, to open ourselves up to catch what’s already happening,” says Beckwith. Engaging the heart attunes one to Spirit’s highest ideal. Releasing limited beliefs in lack or inadequacy, we become big­ger and bigger places through which God’s ideal can come forth. We grow in our ability to allow the divine idea for our life to be expressed through us. Beckwith’s life visioning uses a step-by-step meditative process to draw forth our intuitive guid­ance. The foundation for this process is an atmosphere of unconditional love, which moves us into a deeper awareness of our oneness with the all-loving nature of Spirit. In this expansive environment of unconditional love, we enter into an attitude of deep listen­ing. We attune with “reverent alertness” to the loving guidance of Spirit. Throughout the process, we write down any guidance that comes to us. At first we may not clearly understand that guidance-we may simply see a particular color or just feel a deep sense of peace. However, with ongoing practice, we become better able to “hear what is being broadcast,” as Beckwith says. Our intuitive capacity develops and we gradually come to understand the lan­guage of the vision seeking to emerge through us. The life visioning process, fostering our conscious recognition of Spirit as us, opens us to the highest idea for our lives. When we commit to allowing our vision to be expressed through us, everything we need for its fulfillment flows. Through life visioning, we can fulfill our true callings as spiritual beings. Through life visioning we can fulfill our true callings as spiritual beings.